The Unique Exterior of the Chrysler Pacifica | Bill Howich Chrysler Ltd. When you need a minivan that you can trust to take care of your transportation needs in Campbell River, consider the new Chrysler Pacifica. It was designed with safety in mind but maintains a stylish exterior that is sure to turn heads. Bill Howich Chrysler Ltd. can show you the various options you have available to improve your overall driving experience. The Chrysler Pacifica is available with LED daytime running lights to ensure that other drivers can see you in any type of lighting conditions. It can also come equipped with bright HID headlamps to maximize your ability to see the road when it's dark out. 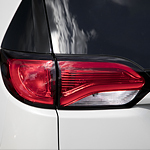 To protect against impact during an accident, the Chrysler Pacifica is made of a dual-phase lightweight steel. The frame was designed for strength. You can have the peace of mind that it will keep you protected if you are involved in a collision.